Nothing tastes better after a crushing bar trivia defeat than a steaming plate of nachos. This week, we’re stuffing our faces at Clarke’s in Faneuil Hall. According to one Nacho Patroller, the ladies room wasn’t anything to write home about, though the stalls were large enough that you didn’t have crawl over the toilet to close the door (ladies, you know what we mean). One of our guest patrollers also commented that the bathrooms appeared clean, but thanks to the dark colored tile, could be secretly filthy. We would post a picture, but we didn’t want to be “those girls” taking photos in the ladies room. So, we suppose a guarded “well done” is deserved. But this isn’t Bathroom Patrol (add that to the list of blogs to write after we’ve eaten all the nachos in Boston). On to the ‘chos. Appearance: (8) It was generally agreed at our table that these nachos were some variation of “b-e-a-utiful” or “ha-uuuuge.” While the presentation was on the sloppy side, the mouthwatering display of cheddar cheese, grilled chicken, jalepenos, fresh tomatoes and green onions, and multicolor chips left us ready to dig in. Distribution: (9) At first glance, we thought distribution would be a problem. 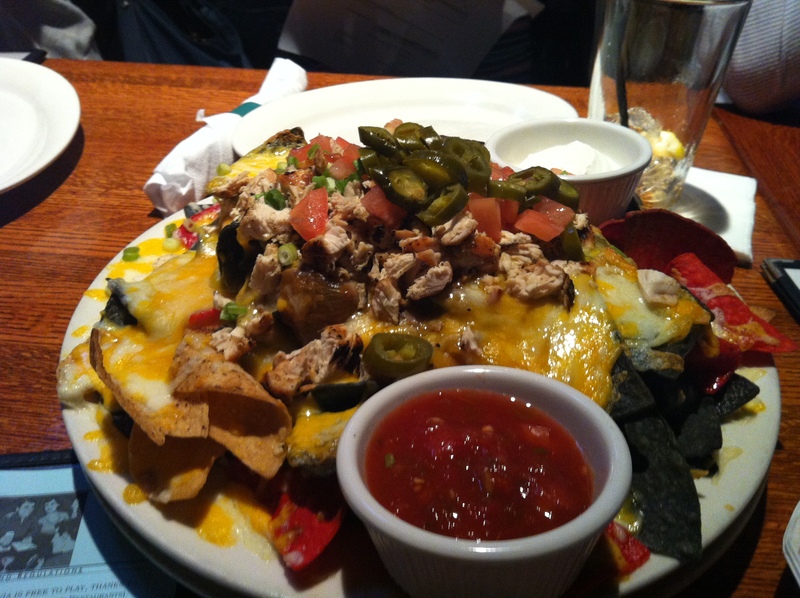 Typically when we see that much cheese atop a plate of nachos, it means that there won’t be much left in the under-layers. This was absolutely not a problem here: the cheese was layered all the way to the bottom, with just enough crispy chips left unsoaked to use for dipping. These nachos had both chicken and cheese. Our one complaint is that the scant quantity of chili was hidden in the middle, requiring a bit of excavation. Quality: (6.1) Good flavors on the whole, but nothing to get us excited. The chicken was moist, but not especially flavorful. Chili was generic, but tasted homemade. Salsa was great! Price: (7.1) We toyed with the idea of getting the $25 nacho platter, but we’re glad we stuck with the well portioned $12 plate. The smaller size was enough for an appetizer for four people. $10 would have been a more reasonable price, so we assume that extra $2 went to the Faneuil Hall Atmosphere Fund. ← Yard House: Want Some Nachos With That Beer?